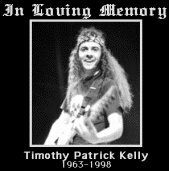 Tim Kelly, Slaughter guitarist and really nice guy. Tim died when an 18 wheeler jackknifed and hit his vehicle on a remote Arizona road. ← She is no alien, Alf. Enter your email address read all our articles and receive notifications of new posts by email.